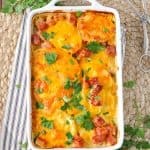 From my childhood dinner table, these Leftover Ham and Cheddar Scalloped Potatoes are classic Southern comfort food with only 10 minutes of prep! Preheat oven to 400F (200C). Spray an 11 x 7-inch baking dish with cooking spray and set aside. In a large pot, melt butter over medium-high heat. Whisk in milk, garlic, and salt. Add sliced potatoes. Bring to a boil, reduce heat to medium-low, and cook (uncovered) for about 15 minutes (or until potatoes are tender). Gently stir the potatoes periodically as they cook. Add the ham to the potato mixture. Spoon into prepared baking dish. Sprinkle with grated cheese. Bake for 20-25 minutes, or until golden brown. Let stand for 5-10 minutes before serving. *I like to use my hand-held mandolin slicer to quickly and easily cut the potatoes. A sharp knife will also work!